We’d love your help. 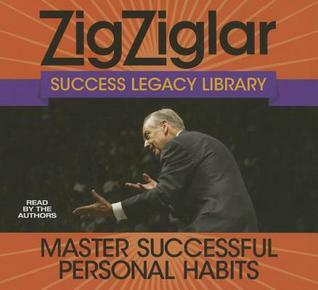 Let us know what’s wrong with this preview of Master Successful Personal Habits by Zig Ziglar. What will your legacy be? What lasting imprint do you want to make on the world? With thi In the world of personal development, motivation, public speaking and sales, there will never be another Zig Ziglar (1926-2012). His infectious sense of humor, his masterful story-telling skills, his uncanny ability to inspire, and his downhome charm...that is the legacy of Zig Ziglar. To ask other readers questions about Master Successful Personal Habits, please sign up. This fell short of my expectations. It's a series of Ziglar's motivational speeches. I found them underwhelming; maybe I'm not the target audience. Topics include: Definition of success, self-image, how to teach responsibility, motivation, and optimism. I agree with Ziglar's stance on most issues. I read this because it was recommended by WP Elevation. A person is more likely to succeed if you tell them you're confident and I'm doing a good job then if you tell them should be careful and not This fell short of my expectations. It's a series of Ziglar's motivational speeches. I found them underwhelming; maybe I'm not the target audience. Topics include: Definition of success, self-image, how to teach responsibility, motivation, and optimism. I agree with Ziglar's stance on most issues. A person is more likely to succeed if you tell them you're confident and I'm doing a good job then if you tell them should be careful and not screw up. You'll perform better if you are determined to win then if you're determined not to lose. "You cannot consistently perform in a manner which is inconsistent with the way that you see yourself." Change your perspective from "got to" to "get to." Take a positive view of your responsibilities. Be excited about doing it. Accept responsibility for being there and performing. Be disciplined to stay right with the task. This is not the Word of God of whom none other matches, just to be clear. I thought this series of talks I listened to was just amazing! Anyone who can hear what Mr. Ziglar is saying (and maybe some at the bottom or too proud won't) will be helped by this book. Mr. Ziglar, to my knowledge is one of the rare 'one of a kind' people that is really missed when gone. I recommend it to anyone and everyone. For your own good, please don't miss this! Here is a link to a decent cover and description I could This is not the Word of God of whom none other matches, just to be clear. Zig Ziglar did not receive all his praise for nothing! It's honest, straight-forward talk, with lots of humor to help the medicine go down. :) Definitely get the audio book, if you can. Zig encourages you to listen to his recordings over and over again - but I won't need much encouragement. Enjoyed the stories, the humor, the lessons and message. Recommend to anyone. Learn to maximize your positive optimism. It's a good audio collection of his speeches. I don't know if I'd recommend the entire thing to someone to listen to. If you've heard one you've heard half of each of them. Some that I definitely want to share with my kids someday, though. So much positive motivation here!